Sometimes interesting ideas have very humble beginnings. In this case my inspiration came when my only tool and paper were a pen and a napkin. 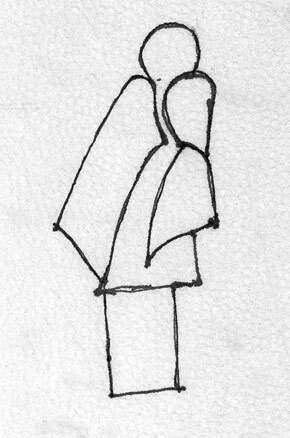 The gesture and form I sketched is the germination of a vision of an interlocking wall sculpture. As an artist the idea is not always fully formed but comes together in the coming weeks or months, in bits and pieces like a puzzle...continuing evolving and taking shape. 'Entidades' is the name I have in mind and I am looking forward to where the sculpture will go from here. Posted on January 15, 2011 by Kim Campbell and filed under Ideas and tagged sketches.